Tesla Motors Inc. (NASDAQ: TSLA), the American company dedicated to produce luxurious self-driving electric cars, has allied with Spotify, the well-known streaming service that offers more than 30 million songs. From now on Model S from Tesla will be equipped with free Spotify Premium, so customers will enjoy music without ads. The renowned Model S from Tesla became popular with an acceleration system that goes from 0 to 60 miles per hour in as little as 2.8 seconds without a drop of gasoline. Later, the company updated the car’s firmware to implement a self-driving system which appears to have a pristine performance. 11,574 Model S cars were sold in the last quarter. It was announced that the Spotify Premium integration will be available in Europe, Australia and Hong Kong. Customers from the United States won’t have the benefit yet but Tesla said they are going to offer the service as soon as possible. Spotify premium costs $10 a month, the streaming service founded on Sweden in 2006 has already 75 million active users worldwide and over 20 million subscribers from more than 58 markets. Last month the company allied with Facebook in order to stream music directly in the personal feeds of the users. “The car radio has not changed much at all, so what we’re doing with Tesla represents the future. Tesla owners will be able to access a full premium experience, free from adverts. This is a very important focus for us and a key strategy and you can expect many more exciting announcements from us in this sphere,” said Jonathan Tarlton, senior manager for Automotive Business Development at Spotify, to the Telegraph. As Jonathan Tarlton explained they want to offer a great experience for customers and it is a key strategy for the company. It seems that with the new integration they will try to attach new customers to Spotify since the account will only function within the vehicle, so users who want to enjoy the service outside the car will need to create a different account. The update will be available on Monday when Tesla will roll out an over-the-air upgrade, which means users won’t need to download it by themselves. 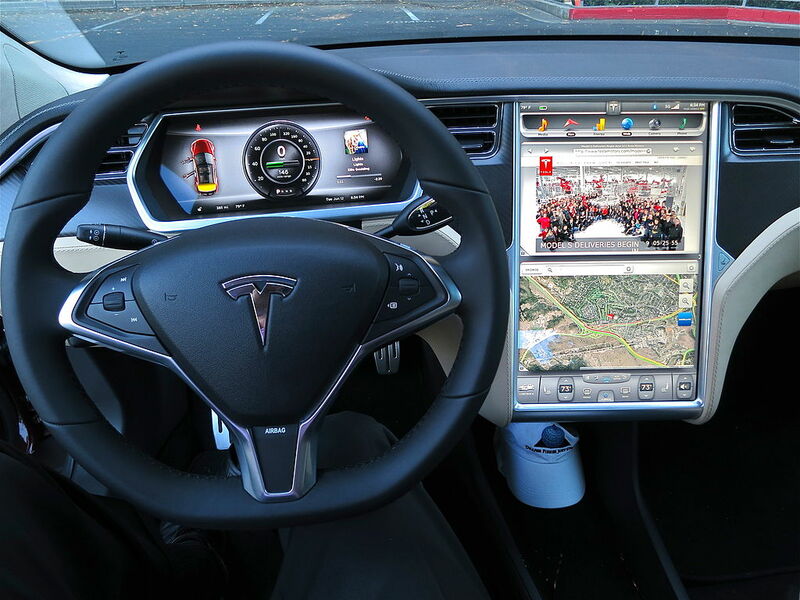 Model S has a 17-inch touchscreen that works with voice control, so users will be allowed to ask their car to play them the tracks they want. The swedish streaming service had previously allied with companies such as BMW, Ford and Mini. It appears that the competition of companies that want to create integration between cars and internet services is getting bigger and bigger every day. It is interesting how much this new segment of cars powered without any single use of gasoline is becoming more popular everyday in the country. According to an analysis from Frost & Sullivan 40% of all zero emissions vehicle sales in the U.S are done in California. It is predicted that sales will grow up to 1.4 million units by 2025 after new zero emissions vehicle requirements take effect in 2017. The number of sales in 2014 was of 60,000 units. That’s why new Porsche plans to enter the electric cars segment could be a safe bet in a market that is getting conscious about the uses of alternative energy. Next year the American company Tesla will unveil a new model that will cost around $35 K, which is the lowest price for a car of the electric car producer. The model will be shown in March an preorders will start in the same month.